I started baking with my Nan, but only really got into it in 2013. I fell ill and was unable to work for 9 months while the doctors tried to work out what was wrong. They thought it was chronic fatigue but eventually I discovered I had polycystic ovarian syndrome. Throughout this time I was stuck in the house feeling exhausted – and to keep myself occupied I started baking. I taught myself new stuff mostly by watching youtube tutorials to make bread, cakes and pastry. I really struggled to mentally deal with being off of work for so long – and baking helped keep me sane, because I’m not someone who can just sit around and do nothing! Eventually, I got the right diagnosis, was put onto medication and within a week felt like a different person. By that point, though, I was totally hooked on baking! What was the best thing about Bake Off? The people I met! You create really strong bonds with the other bakers because you spend so much time together when your filming over the weekend and in the build up to the show launching. You’re the only 12 people in the world who know at the point what it’s like to go through the experience of Bake Off! But the team really looks after you, its a real little family. I’m still really good friends with Ruby and Manon and see them loads. What was your favourite Bake Off moment? Definitely making the Alice in Wonderland pie! It went really wrong when I tried it at home and then luckily all came together on the day. One of the best things about the whole Bake Off experience for me has been inspiring my daughter Nora to enjoy baking and we bake together regularly now. One of my goals is to help her to learn how to make all sorts of delicious food – so she knows how to cook everything well and enjoys it. There are so many fun things with baking that you can do with kids from a really young age! All the other bakers called me Bee because Antony kept calling me Brianna on the first day – so I just said to call me Bee and it stuck. Kim Joy even bought me a little Bee brooch! I run for all sorts of reasons.The PCOS flared up again about a year ago and my doctor told me I needed to lose weight to help the symptoms so I decided to give running a go. I had never really done any running before, other than a 5k event years ago. So I did the Couch to 5k and then joined the This Mum Runs social runs, which I absolutely loved! I also have depression, and I take antidepressants for it. If I don’t do exercise and don’t run, it’s a lot worse. When I run my mood is lifted, physically I feel better, and running helped me lose the two stone that the doctor told me I had to lose. I was never a runner, I wasn’t athletic at school, I hated PE, I’ve never really been into exercise. But I feel like running is something that will be with me forever now, it’s a really important part of my life. What has your experience of This Mum Runs been like? Being a part of the This Mum Runs community has been amazing. There’s just so much encouragement – and people’s stories are so inspiring. There’s no negativity, no body shaming, no ‘run’ shaming. If you’ve run for 10 minutes people will give you credit for that and really praise it, and that’s what you need when you’re building up your running. It was the women I met at TMR who encouraged me to enter the Bristol Half Marathon last year, something I never thought I could do! I also entered the Bath Half Marathon in March – it was cancelled because of snow but I managed to run the distance around Bristol a week later on Mothers Day. I would never have done this without TMR! What’s next for you after Bake Off? It’s such an exciting time and so many potential opportunities are being offered to me right now, its amazing! I never thought that as a stay at home mum from Bristol that anything like this could ever happen to me. While I’m still trying to work out what I really want to do next I’m also trying to balance the inevitable Mum guilt balancing Mummy time with work (we hear ya Briony!) I know I need to make sure that I keep up my running… because I know it will help keep me sane through the whirlwind of life post Bake Off! . So I’ve signed up again for the Bath Half and over the winter I’m determined to make more time for running again. I love being a part of TMR because it gives me that extra nudge and encouragement to get out there every week. Also, I’ve been eating a lot of cake…. A winner will be chosen at random on Friday 30th November 2018 and notified by email. Employees or agencies of This Mum Runs Ltd (“TMR”, “We”) or their family members, or anyone else connected with the Prize Draw may not enter the Prize Draw. By submitting your personal information you agree to receive emails from TMR containing news, offers and other content that we think may interest you. You will be given the opportunity to unsubscribe on every email that we send. The closing date of the Prize Draw is 23:59 on 29 November 2018. One winner will be chosen from a random draw of entries received in accordance with these Terms and Conditions. The draw will be performed by a random computer process. The draw will take place on 30 November 2018. 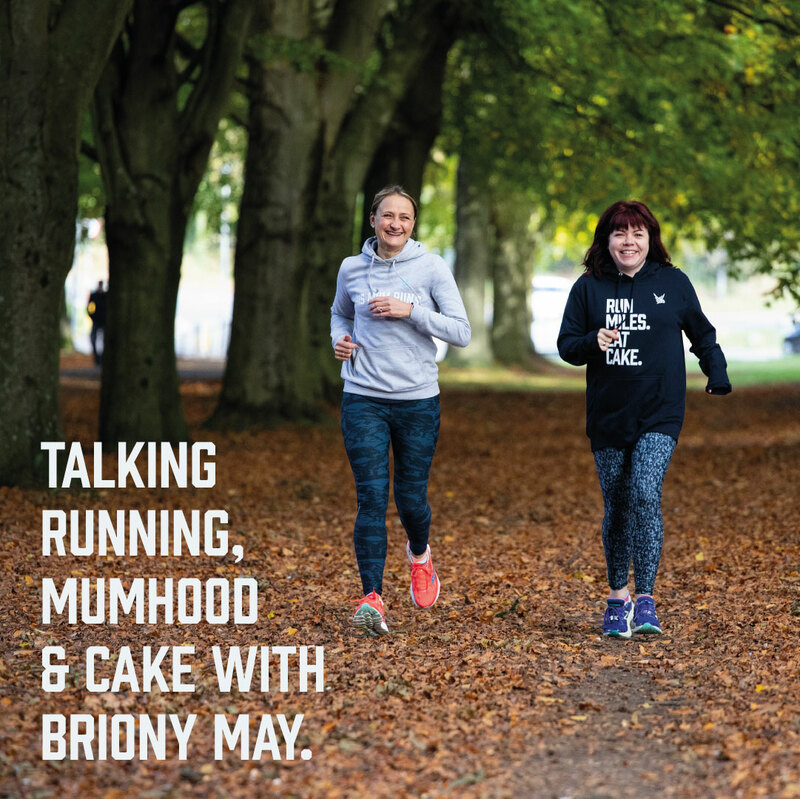 The winner will receive a 2 hour baking tutorial from Briony Williams, which may be via Skype or similar and a selection of merchandise from This Mum Runs Ltd. The tutorial will take place in January 2019 subject to Briony’s availability. TMR retains the right to substitute the prize with another prize of similar value in the event the original prize offered is not available. The winner may be required to take part in promotional activity related to the Prize Draw and the winner shall participate in such activity on TMR’s reasonable request.